The time-honored tradition of a pasta dinner before a marathon might be the ideal meal, but it's important take in enough of the right types of carbs and nutrients before setting out your clothes the night before the race. While it's less important than carbohydrate, easily digestible protein is necessary to repair damaged tissues and also should be part of your pre-race nutrition plan. Glycogen, the body's primary energy source, is stored in muscles and released as needed during the race. Carb loading is done for one reason: to fill glycogen stores in muscle so they last throughout the race. 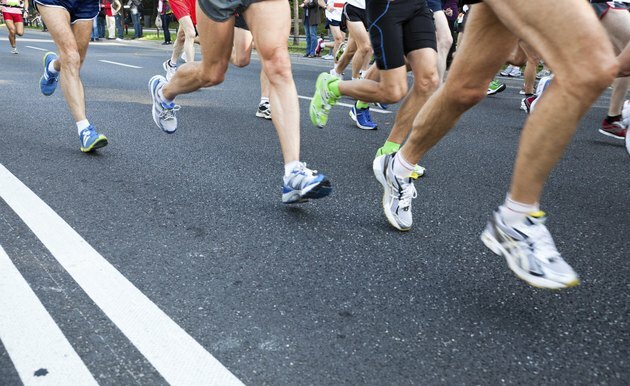 Aim to take in 10 to 12 grams per 2.2 pounds of your body weight daily over the 36 to 48 hours prior to the marathon, advises an article published in a 2007 issue of "Sports Medicine." Going even further might offer additional results -- a 2011 article in the "International Journal of Sports Medicine" found that consuming more than 7 grams per 2.2 pounds per day of carbohydrate the day before the race significantly increased speed and endurance. For a person who weighs 165 pounds, this equals 525 grams of carbohydrate in a day, or around 141 grams per meal. A 1-cup serving of cooked spaghetti contains around 43 grams of carbohydrate. Test out your pre-race carbs before your long runs while you're still completing your marathon training so you know what types of foods work best for you. Pasta, rice, potatoes and other easily digestible carbohydrates such as quinoa or couscous are the traditional foods for the pre-marathon evening meal. If you don't want to eat your carbs plain, use tomato-based sauces, which digest more quickly than cream sauces and are less likely to make you feel uncomfortably full. Protein takes on more importance after the marathon, when you need to rebuild microscopic tears in muscles. But getting 12 to 15 percent of your calories from protein in your pre-race meal helps keep your blood glucose levels balanced and lowers the glycemic index of your meal so you're less likely to experience a drop in blood sugar. Because protein is a less efficient fuel source than carbohydrate, taking in too much protein before a race can increase your risk of dehydration, as your kidneys need more water to eliminate protein waste products. Skip the heavily-marbled and fatty steak in favor of low-fat chicken, fish, eggs or yogurt as your protein source at dinner before the race. Certain foods take more energy to digest, leaving you with less energy to expend on keeping your legs moving forward. Carbohydrates that are high in fiber can lead to digestive discomfort during the race, while carbohydrates that are high in sugar can lead to diarrhea. Fats take longer to digest than carbohydrates and can divert energy away from muscles and into your digestive tract, causing stomach cramping.